Hear ye! Hear ye! Calling all lords and ladies of the realm, princes and princess, knights and ne'er-do-wells: relive the days of Merrie Olde England. 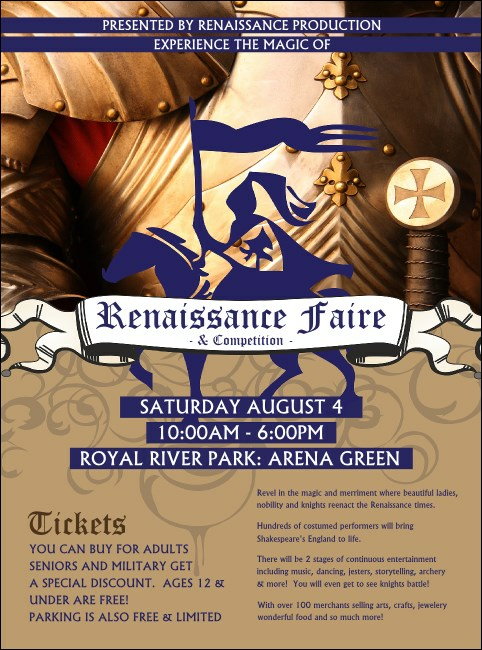 The Renaissance Faire Armor Flyer promises a fantastic world of artisan craft booths, feats of skill and strength, anachronistic turkey legs and more, all awaiting your guests. Fill in the easy template below and we'll send them your way! It's always festive at TicketPrinting.com.